・The first chapter of this book serves as stepping stone designed to sharpen your listening comprehension and help you tackle longer passages. It covers words and sounds that are often mispronounced and introduces fundamental items of grammar. ・The second chapter describes the different question patterns that appear on the new JLPT. Work your way through the practice questions and master each pattern. 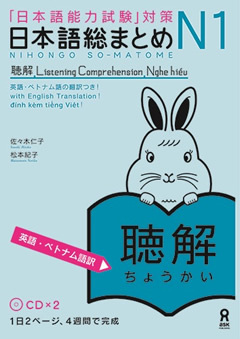 ・The third chapter introduces a number of techniques for understanding different types of conversations. ・The forth chapter is designed to help you master a variety of words and phrases. ・The section "Review and Drills" at the end of each chapter lets you gauge how well you understand the material. ・The "Comprehensive Review" in the last chapter simulates the actual JLPT. Practice answering all the questions to see if you're ready to take on the real test.